(1905 – June 10, 1995) was an Iranian musician and kamancheh player. He was born in Tehran and started his music lessons under his grand father Mohammad Taghi Khan, who was a kamancheh player as well. After three years, his father sent him to his uncles to learn more advanced techniques. Asghar had three uncles (all mother’s brothers): Akbar, Reza and hassan. They were all famous kamancheh players. His first major success was with Ebrahim Khan Mansouri’s Orchestra at the age of 18. He started his own music school in Mashhad, then he moved back to Tehran and became an kamancheh instructor in Honarestan under Ruhollah Khaleghi. He played with most famous Iranian musician such as Hossein Tehrani, Ahmad Ebadi, and Abolhasan Saba. He also was a professor of music in Tehran University for a few years. He toured France, Belgium, Germany’ Italy’ England and United States[America]. He died in Tehran.he was the best kamanche player in the world. Kamanche belongs to the Chordophones category of instruments, and in more details to Bowed Stringed Instruments or it can be said Kamanche is a Persian Spike Fiddle. The word Kamanche means in Persian language a small bow. Kamanche is played in many different cultures and regions, like in Iran, Azerbaijan, Armenia, Turkey,…and with different pronunciations and different names, like Kamanche or Kamancheh or Kamantche in Iran, Kamancha or Kamantcha in Azerbaijan, Kemanche or Kemancha or Kemantcha in Armenia, Kabak Kemane in Turkey, Ghijak (Gijak, Gidzhak,…) in Central Asia, Rababa in Arab countries…. Kamanche is played both in classical and folk Music. Strings were first made of gut or silk. Modern strings may be gut, solid steel, stranded steel, or various synthetic materials, wound with various metals. Kamanche strings are produced in the countries, in which Kamanche is played, but the quality of these strings are not good enough, that is why many Kamanche players try to use Violin or Viola strings for Kamanche. Kamanche players will usually change a string when it no longer plays true or when it loses the desired tone. We count the strings from the highest tone to the lowest tone. Kamanche has mainly four strings at the present time, but there are some kinds of Kamanche that they have three strings and there were at the past time some kinds of Kamanche with two until six strings. If we put Diese (sharp) next to a note, the note will become half note higher, Bemol (flat), half tone lower, Sori, 1/4 tone higher and Koron 1/4 tone lower. The signs and definitions that we use here, are only to show the exact notes that we play in the mentioned musical culture. For example when we use Mi Diese, we do not mean the note, that is half tone higher than Mi, but we mean the note between Re and Mi Koron. It means the usage and function of the signs are not exactly like the definitions of the signs. We count the strings from higher to lower. The most usual tunings are Re La Re La and Re Sol Re Sol. which is ancestor to most modern European and Asian bowed instruments. cultures and areas, such as Iran, Azerbaijan, Armenia, Turkey and etc. bow in the manner of the European violine. instrument. The rest of the paper is organized as follows. a Kamanche by using the Golden section. paintings, from Mongol and Timurid periods. shows a woman playing the Kamanche (Figure 2). last king of this dynasty), sang with Kamanche and Ney. kind of Violin called Kamanche. and the region of the country where it is played. 2. Curt Sachs, The History of Musical Instrument, W.
Numbers, World Scientific Publishing, 1997. Although there is a great discrepancy concerning the history of many instruments, the first manuscript which deals with the musical instruments including kamancheh – under the title of “rabab” – is Almusiqi-Alkabir by Farabi, the great Persian philosopher and scientist of 9th and 10th centuries. 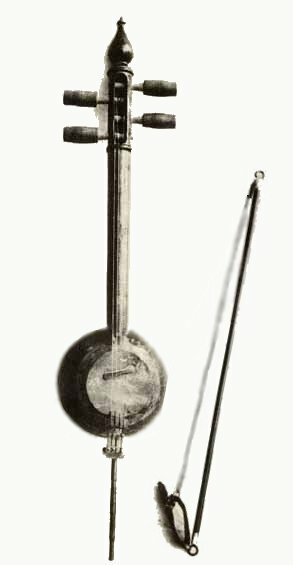 A.D.
Farabi did not mention using a bow for rabab, and this the reason why so many scholars considered it a non-bowed instrument. Nevertheless his description of the instrument is totally concordant with kamancheh that he classified it into 3 groups: Raba-e Sha’er, Rabab-e Mesri and Rabab-e Torki. Four centuries later, Abdulqader Maraqe’i in his two major books gives comprehensive details of the instrument. Ruhollah Khaleqi believed that kamancheh is one of the oldest instruments in Eastern hemisphere. Albert Lavignac in La musique et les musiciens pointed out that the oldest bowed instrument is ravanstron, in fact a Chinese instrument, Khaleqi also traces back the origin of kamancheh to Qezh or Qezhak belonging to the pre-Islamic culture of Iran. In the great hall of Chehelsotun (Safavid dynasty) there is a fresco which shows a musician bowing a kamancheh. This is the oldest document revealing kamancheh and its usual style of playing. During Qajar period musicians added a fourth string to the instrument after getting familiar with violin, an instrument which exerted a forceful influence on kamancheh playing and also on the players. There is also another type of kamancheh used in regional music of Iran. This folk instrument is often with three strings. This entry was posted on Friday, March 8th, 2013 at 20:37	and tagged with Asghar Bahari, cytopicus, Kamanche, Music of Iran, Ostad Asghar Bahari, Parham Nassehpoor, ram51 and posted in PERSEPOLIS. You can follow any responses to this entry through the RSS 2.0 feed.